You are amazing!!! I love the story, and I’m so proud of you. Facing a fear is huge. Mine was in 2004 – years of being afraid of drowning conquered by learning how to surf. Terror that led to Freedom. Love to you and the family! Awesome story, Paige. I too grew up in New England, and never learned how to ski until I was in my 20’s. And it was my boyfriend (now husband – also an epic skier) who encouraged me to give it a whirl. Good for you for staring fear in the face and kicking it down the mountain. Go Mom! 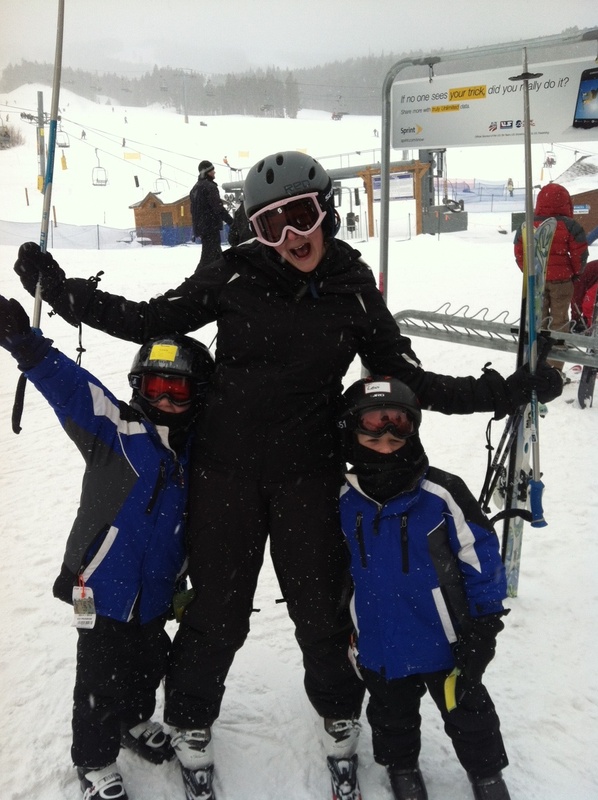 Way to be a role model, and having fun to (ski) boot is just the cherry on top of your hot chocolate. What a great entry! I’m glad you enjoyed it. We’ll have to get you all to Mad River for some real East Coast skiing…maybe next year when we actually have some snow. Have a safe trip back! Congrats, Paige! Loved your story. You are brave as ever. I grew up skiing and love it, but never really LOVED it until about two years ago when Adam and I were skiing with the girls. There’s no place on earth I’d rather be than on a ski slope with them. Hard to complain about being cold on the lift… I was too busy pointing out animal tracks in the snow with a three year old. Showing them that Mommy is nice, but is also happy to cover them with a blast of snow dust. Now it’s all I can do to keep up with them. 🙂 Family fun at it’s finest. Good for you! So glad you are having fun and it probably feels great to have some of the weight of imagination and mystery off your back. Enjoy! You make me want to go skiing RIGHT NOW! It’s a lovely story…thanks for sharing it.